Are your thoughts dictating your life? Do you feel the need to control your thoughts and feelings? Does it actually work? Life feels very different today in the UK and many other westernised societies compared to 50, 100 or more years ago. Survival rates from serious health issues are improving year on year, babies who might have died from birth complications are now surviving, we do not fear war. We are living in fortunate times. This also compares starkly to other countries over the world who live in daily fear of war, terror, famine and disease. So why in our civilised society do we persistently try to control our thoughts and feelings? Why are therapeutic groups springing up teaching us about mindfulness, being in the moment and allowing our thoughts and feelings to simply be and then allow them to be released? Perhaps as a recent article in The Psychologist suggests, thought suppression doesn’t work. Research over the past twenty years asserts that actively trying to suppress thoughts and feelings can have unexpected consequences (Erskine and Georgiou, 2011). The thought that you are trying to avoid will become more prevalent and if the thought concerns a behaviour then the likelihood is that you will want to engage with that behaviour. It is asserted that avoidance makes one less able to control what one thinks and does. So how often have you tried to resist something because you were afraid you might actually do it? Perhaps you fantasise about someone and as much as you try to push that person from your thoughts, the more you think about that particular person. If you happen to be on a diet, thoughts of chocolate are never far from your mind… so in an effort to suppress those thoughts, you end up being propelled to break the diet. Thought suppression can be our own worst enemy, according to Erskine and Georgiou. Thought suppression is the act of deliberately trying to rid the mind of unwanted thoughts (Wegner, 1989). 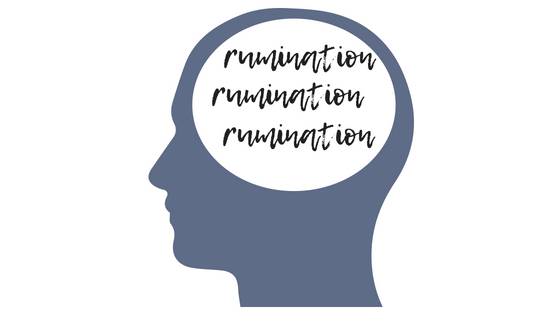 Research shows that this behaviour often results in an increased return of an unwanted thought, in a “rebound effect”. An example – after watching a disturbing news item it may be a desire to suppress thoughts about the footage but the result is that I may become obsessed with it instead. There are instances of people in everyday life who blurt out things that they are trying to suppress. Is it possible that someone suppressing thoughts about a particular behaviour will paradoxically be more likely to engage in that behaviour later? Suppressing thoughts about an attractive individual is not to avoid thinking about this person but to avoid acting on these thoughts. Wegner’s ironic process theory (1994) suggests that when people try to suppress thoughts this activates two distinct processes. First there is an operating process that tries to create the desired state of mind; this acts to seek out contents that are in agreement with the desired state (anything other than the suppressed item). This is a conscious and thought out process which can render thought suppression hard work. So when suppressing thoughts of craved food, we will seek out other less dangerous thoughts to distract ourselves. The suggestion is that suppression sets in operation another more automatic process (monitoring). This is a continual search for thoughts that one has failed the suppression task, which means one is continually looking for the suppressed thought. Paradoxically this has the effect of sensitising the mind to the very thought one is seeking to avoid – in other words, raises the activation level of the suppressed thought. This then makes it *more* likely that thought suppression directly leads to the suppressed item to gain activation (Klein, 2007, Wegner & Erber, 1992). How many times have you picked up something fragile saying to yourself “I must not drop this” or carried a hot mug of tea “I must not spill this” and ended up spilling or knocking the fragile item in some way? Next ArticleHow to Relax Now!